DUBLIN boss Mick Bohan expressed his frustration as they started their National Football League Division One campaign with a low-key defeat to Donegal in Croke Park on an icy cold Saturday evening. 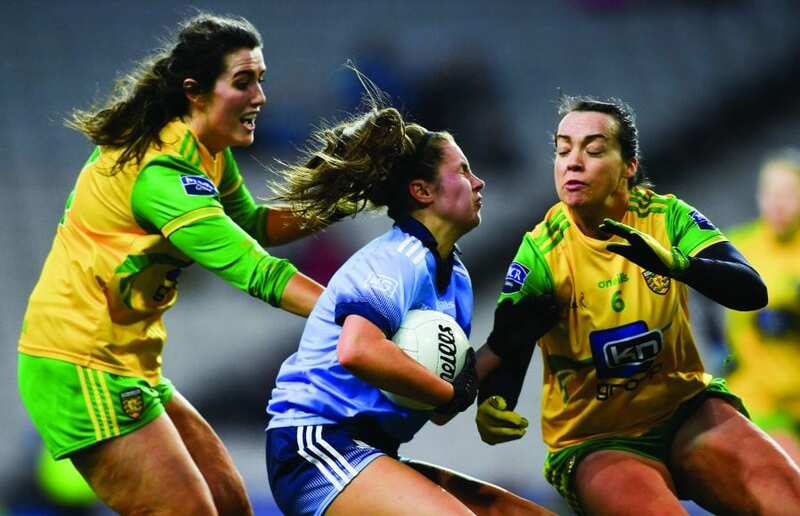 The Jackies lost out to Donegal in a game that saw a low crowd with the weather and a clash with the Six Nations reducing numbers for their first outing as they begin the defence of their double success. “We are disappointed with the display. We just didn’t have our usual cohesion. We don’t enjoy losing,” Bohan said. “But I’d be more disappointed by the way we played. The way we went after the game rather than the result. “If we had lost the game but we had gone after it with the right approach, I’d probably feel a bit better about it. Indeed, there were seven changes from the side that started the All Ireland final for the champions last September. Absent from the side were Sinead Finnegan, Leah Caffrey, Sinead Goldrick, Noelle Healy and Sinead Aherne while Lauren Magee and Lyndsey Davey were named amongst the Dublin replacements for the clash with the Ulster champions. 2018 Dublin minor captain Sarah Fagan – from Clontarf – came in to make her debut. She was part of a quintet of minors stepping up with Kate Sullivan (St Sylvester’s), Hannah Leahy (Scoil ui Chonaill), Niamh Hetherton, Caoimhe O’Connor (both Clontarf) and Eimear Loughlin (Cuala) included on the subs list. They conceded an early goal to effective Donegal captain Karen Guthrie, and then, having closed the gap to a single point, let Donegal take charge again going into the break, the visitors heading in 1-5 to 0-5 in front. Dublin’s main threat came from familiar outlets Carla Rowe and Nicole Owens, with the effervescent Lyndsey Davey making an instant difference when she came on mid way through the second period, playing off Rowe to fire into the net with pretty much her first touch of the contest. Aside from the goal, though, Dublin had a poor second period, managing only two further points as the visitors took charge. Donegal showed great discipline, and had held a six point lead before Davey’s net, one they never really looked like giving up. Guthrie in particular, but also the consistent free taking of Geraldine McLaughlin, were the key threats, with the All Ireland holders looking considerably rusty, particularly in a relatively new-look defence, as they were ultimately beaten fairly tamely.